Jaden Smith is an American actor, singer, rapper, songwriter; and son of the famous actor Will Smith and model Jada Pinkett Smith. Jaden has been a part of the acting world since he starred in The Pursuit of Happyness at a very young age with his father. As of 2019, Jaden Smith’s net worth is $8 million. Jaden Smith was born on the 8th July, 1998, in Malibu, California. His father is of course the famous actor/rapper Will Smith, and his mother Jada Pinkett is an actress, singer, and dancer. Smith has an older half-brother Trey, and a younger sister Willow, who is also a singer. Jaden attended New Village Leadership Academy, but ended up being home-schooled by his parents. He had always been interested in acting, with his very first role playing Christopher Jr. in The Pursuit of Happyness. It wasn’t long before Jaden was starring in box-office movies. After The Pursuit of Happyness, he was cast in The Day the Earth Stood Still, and starred in The Karate Kid. A few years later, he also starred in a film called After Earth with his father also playing a lead role. However, apart from acting, Jaden has particularly taken to singing/rapping. His first ever song recorded with Justin Bieber, which was named “Never Say Never”. Since then, Smith has recorded multiple songs, started his own clothing line, and even partnered with the spring water company ‘Just Water’. And all of this achieved by the young age of 19. As of 2019, Jaden Smith’s net worth is estimated to be $8 million. Jaden Smith had already followed in his father’s footsteps from a very young age, and has since had a diverse career before he’s even 20 years old. Singing, rapping, acting and being involved with several business ventures on top of that. 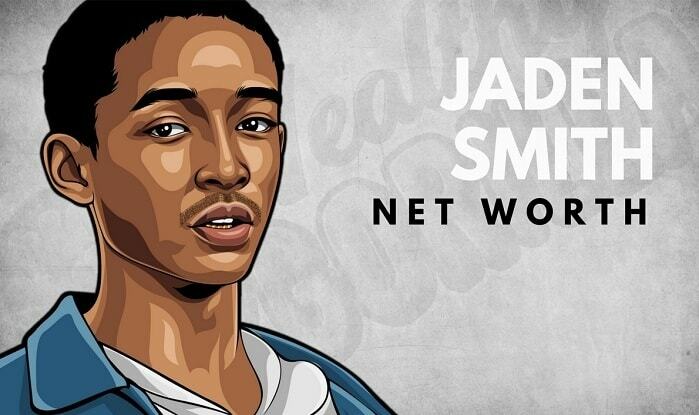 What do you think about Jaden Smith’s net worth? Leave a comment below.